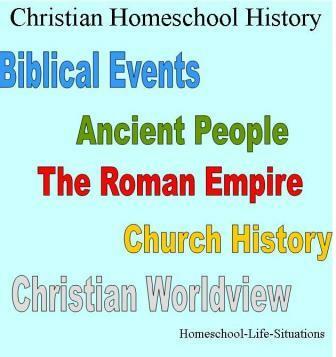 What do you include in a Christian homeschool history class? I like to always start with the Bible. Then because the nations of Egypt, Rome, and Greece are mentioned we study about ancient civilizations. I might continue with how the church influenced world history. I would finish with how some of the first people that came to the United States did so for religious freedom. Most of the Old Testament tells the history of Israel. You can also learn some about Egypt and other ancient civilizations. The New Testament tells about Jesus and the birth of the church. It also mentions the Roman Empire. When my children were young we watched videos about different biblical characters. Egypt, Rome, and Greece are also important to learn about in your Christian homeschool history class. In the Bible we learn that several important people went to Egypt such as Abraham, Isaac, Jacob, and Jesus. Moses came brought the nation of Israel out of Egypt. When my children were younger we studied about the pharaohs of Egypt. We also made pyramids out of sugar cubes and learned about hieroglyphics. We also watch the movie Moses by Disney. When we studied Rome we watched Ben Hur. My children liked the chariot races. I like to start my study of church history with the book of Acts and epistles. If you have a Bible atlas you can also add some geography to your Christian homeschool history. Find the different cities that are mentioned in the Bible on the Map. We also traced the missionary trips of Paul. We read biographies of church reformers such as Martin Luther and John Calvin. Another area that we added to our Christian homeschool history was stories about missionaries. There are books that are written especially for children. We also have studied how the Bible came to us. With my children in middle school and high school we have discussed the Crusades and the reformation. When we have studied United States history we have learned about people who came to America seeking religious freedom. Here is a list of books that are helpful when teaching Christian history. and World Empires, World Missions, World Wars. She also has curriculum that goes with the CDs. I have used the Roman, Reformer, Revolutionaries with my teenagers. We especially liked the lists of books for each time period. I found most of the books in our library. I let my children choose the books that they wanted to read. They would tell us about interesting facts that they read. We also enjoyed the hands-on projects that were in the book. We did not only learn about the history of the time we also learned about the art and culture. Tapestry of Grace uses world history as their core. History is presented chronologically. In Tapestry of Grace the same period of history is presented every four years. Ruth Beechick has written two ancient history books. Adam and His Kin: Lost History of Their Lives and Times presents Genesis in an easy to read format. Genesis: Finding Our Roots is a historical study of the book of Genesis. It is for children who are in junior high or older to do independently or for a family to do together. Having a Biblical timeline is also important. I have not had to buy one because the Weaver had timelines in the curriculum. If your curriculum does not provide a timeline there are several books that you can buy. Christian homeschool history should start with the Bible so that we can develop a worldview. Then we need to look at ancient and modern history through biblical eyes.